The Eighty-ninth United States Congress was a meeting of the legislative branch of the United States federal government, composed of the United States Senate and the United States House of Representatives. It met in Washington, DC from January 3, 1965, to January 3, 1967, during the third and fourth years of Lyndon B. Johnson's presidency. The apportionment of seats in the House of Representatives was based on the Eighteenth Census of the United States in 1960. Both chambers had a Democratic supermajority. It is regarded as "arguably the most productive in American history". Some of its landmark legislation includes Social Security Amendments of 1965 (the creation of Medicare and Medicaid), the Voting Rights Act, Higher Education Act, and Freedom of Information Act. January 4, 1965: President Johnson proclaimed his "Great Society" during his State of the Union Address. January 20, 1965: Inauguration of President Lyndon B. Johnson for a full term. October 3, 1965: President Johnson visited the Statue of Liberty to sign the Immigration and Nationality Act of 1965. The first page of the Voting Rights Act. House Republicans showing their approval for newly elected House Minority Leader Representative Gerald R. Ford as Senate Minority Leader Everett M. Dirksen raises his hand. Senators are popularly elected statewide every two years, with one-third beginning new six-year terms with each Congress. Preceding the names in the list below are Senate class numbers, which indicate the cycle of their election. In this Congress, Class 1 meant their term began in this Congress, requiring reelection in 1970; Class 2 meant their term ended with this Congress, requiring reelection in 1966; and Class 3 meant their term began in the last Congress, requiring reelection in 1968. Names of members are preceded by their district numbers. House Speaker John McCormack (standing), speaking at a Department of Defense luncheon, February 1966. (3) Olin D. Johnston (D) Died April 18, 1965. (1) Harry F. Byrd (D) Resigned November 10, 1965. (2) Patrick V. McNamara (D) Died April 30, 1966. 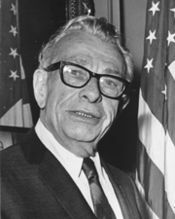 (3) Donald S. Russell (D) Interim appointee lost nomination to finish the term. 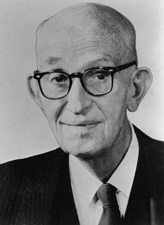 (2) A. Willis Robertson (D) Resigned December 30, 1966, having lost renomination. 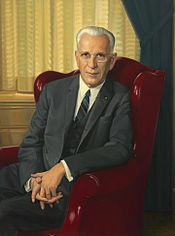 (2) Ross Bass (D) Resigned January 2, 1967, having lost renomination. ^ Karen Tumulty (April 9, 2014). "LBJ's presidency gets another look as civil rights law marks its 50th anniversary". The Washington Post. Retrieved April 9, 2014. House of Representatives Session Calendar for the 89th Congress (PDF). Official Congressional Directory for the 89th Congress, 1st Session. Official Congressional Directory for the 89th Congress, 2nd Session. Pocket Congressional Directory for the 89th Congress.